Here is a rare and unique frame that was tucked away somewhere in the far reaches of my memory bank, the hard drive of my mind, if you will. It recently came to the forefront when I discovered these old photos. No, there is nothing wrong with your eyes, and those wheels are standard 27”. (700c) It is just a very large frame. I can’t remember exactly what size it is, but it was built for seven foot basket ball player Bill Walton. 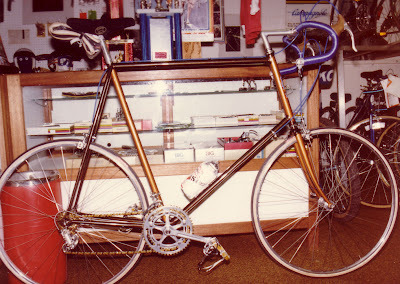 It was the end of 1980 and I had just arrived at Ted Kirkbride’s frameshop in San Marcos, CA to build the Masi frames. Ted had just got this order for a custom built bike for the San Diego Clippers star player. The frame was a joint effort, I did the main brazing, then handed it over to Ted Kirkbride to finish. The frame was painted by Masi’s painter Jim Allen. 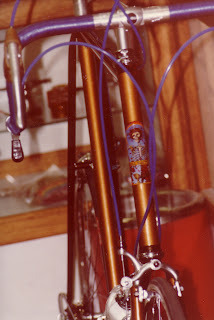 Bill Walton did not want any maker’s name on the frame, but instead had a custom “Grateful Dead” decoration painted directly on the head tube. 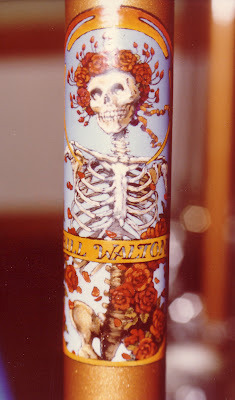 Bill Walton was, and still is an ardent “Dead Head.” San Diego artist Dan Thoner did the hand painting on the frame. So what kind of frame is Bill Walton’s? It is a Ted Kirkbride as he took the order, designed the frame, did much of the work and sold the frame. However, as Ted never put a frame out with his own name on it, (As far as I know.) The nameless frame arrangement suited both buyer and seller on this occasion. I don’t lay claim to the frame, but only write about it here because it is a part of my history, and probably the biggest frame I ever worked on. Ted Kirkbride owned the frameshop were the Masi frames were produced in the early 1980s. He later bought the company. Most of the frames he built were custom and special order Masi frames. I wonder if Bill Walton still has this bike, and if so does he still ride it? I would imagine the demand for used bikes to fit a seven-foot bike rider would be pretty small. Footnote: Dan Thoner who did the fine art work on this frame is the same artist who later did the design work for my Fuso logo; working from rough sketches of my idea. There is a picture of Bill Walton riding a gigantic custom track bike in Eddy B's published training manual. Do you by chance know the origins of this frame? um, 27" is not 700c. they differ enough to require longer-reach brakes for some 27" to 700c conversions. Throughout my cycling career since the early 1950s the standard tubular tire and rim, which were fitted to this bike, were always referred to in England as a 27 in. sprint rim. I rarely fitted clinchers to my bikes until I came to the US, these were known as 700c. I don’t recall using different reach brakes. Maybe you are talking about something else. This blog has readers in the UK and many other countries; I try to cover all terminology and maybe some of it is outdated, but then so am I. Bill Walton’s track bike was built by Ted Kirkbide about the same time as this road bike. I have a photo of it, unfinished. I love the Regina Oro chain and freewheel combo! Haven't seen that in ages. what length cranks would someone 7' tall require??!! Great post, Dave. It's really neat to see older stuff that is new to me. That's really awesome! 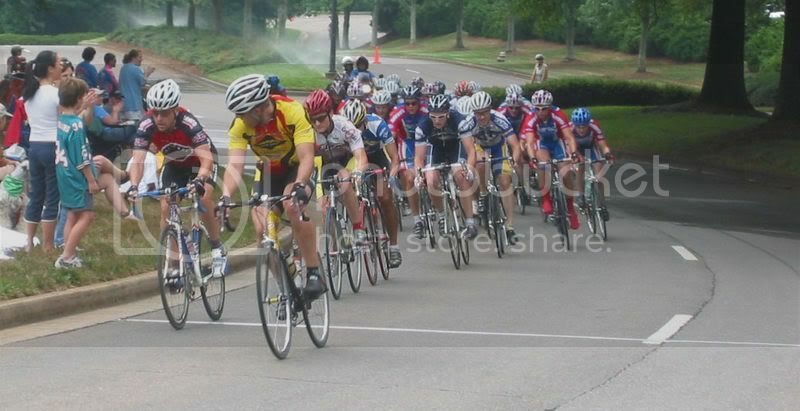 You should come visit Greenville this weekend for the USPRO Championships. I'll be working neutral support with Mavic. I'd love to pick your brain for a few minutes if you come. Great blog. It's one of my daily reads. This is great. I love these completely outsized bikes. don't mean to nitpick, but 27 and 700c are different rim sizes (at least for clinchers). The 700c has a 622 mm bead diamter and the 27" rims are 630mm. Hi Dave, Susan Cunningham at CyclArt here. I was doing an internet search on Dan Thoner and found your blog entry. It actually was CyclArt that painted that giant frame, then Dan did his delicate hand painting, before returning it to us for Clearcoating. I have a photo of me (I'm 5'3") standing over the bare frame and it barely fits, without wheels of course! We still work with Dan on occasion and more of his beautiful handpainting on bicycles can be seen on our website or write me for photos. Cheers!